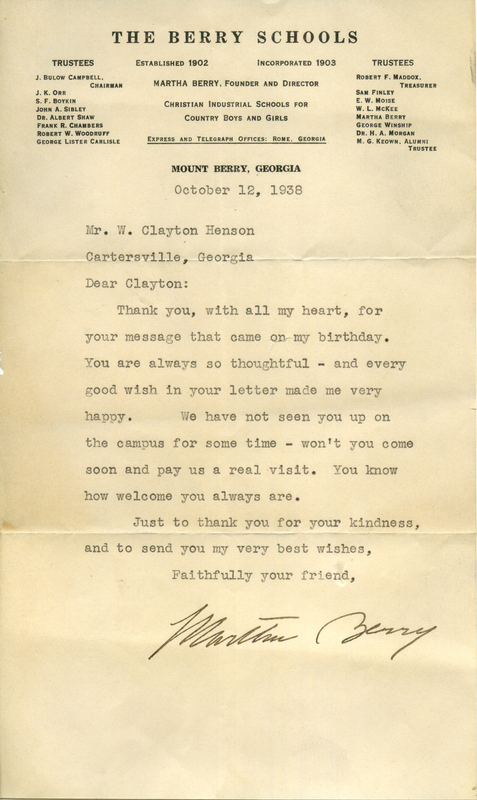 A letter to W. Clayton Henson from Martha Berry, thanking him for his birthday wishes and inviting him back to the schools, as he had not been there in quite some time. Miss Martha Berry, “Letter to W. Clayton Henson from Martha Berry.” Martha Berry Digital Archive. Eds. Schlitz, Stephanie A., Justin Karch, Jessica Hornbuckle, et al. Mount Berry: Berry College, 2016. accessed April 26, 2019, https://mbda.berry.edu/items/show/14484.